Capt. 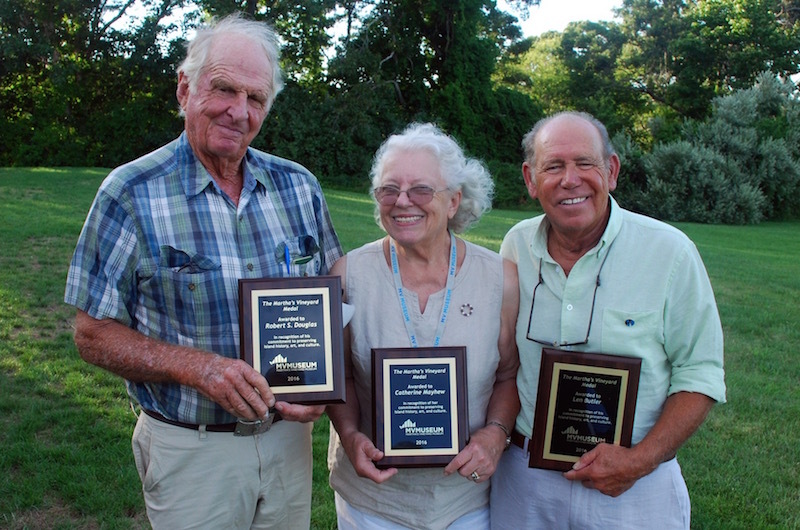 Robert Douglas (left), Kay Mayhew and Len Butler, recipients of 2016 Martha's Vineyard Medals. 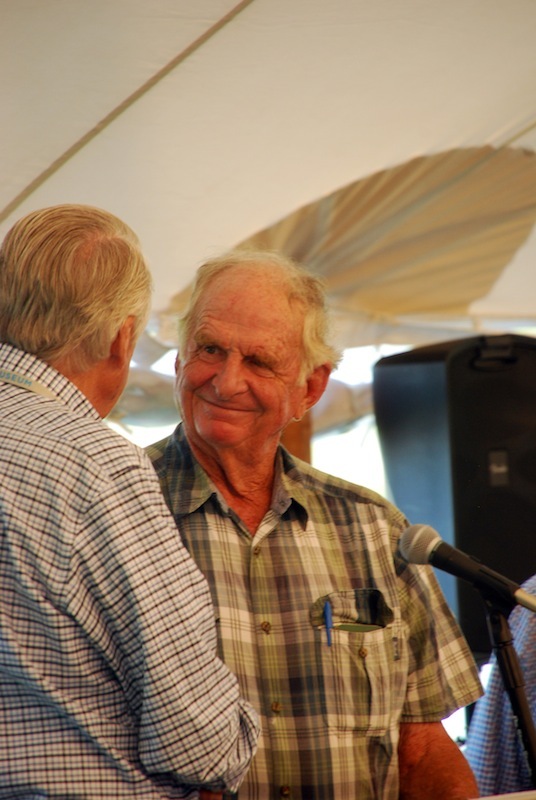 The Martha’s Vineyard Museum recently honored three Vineyard residents for their service to the Island. At a ceremony earlier this month, Len Butler, Robert S. Douglas and Catherine (Kay) Mayhew each received a 2016 Martha’s Vineyard Medal. The medal honors residents who have contributed to the history, arts and culture of the Island. Mr. Butler played a lead role in relocating the Gay Head Light last year, serving as chairman of the lighthouse relocation committee, navigating reams of bureaucratic red tape and poring over the lighthouse structure and geology of the nearby eroding cliffs. Through it all, he maintained his day job as a senior site supervisor at John G. Early Construction, where he has worked since 1972. A museum video of the event was made available to the Gazette. Mr. Butler in turn recognized Mr. Skidmore for spearheading the project four years ago, and the many others who helped make it happen. Mr. Douglas has long ties to the Island maritime culture. The captain of the schooner Shenandoah, which he designed and built in the 1960s, has helped thousands of school children learn about sailing and life at sea. He also founded The Black Dog company, whose flags fly on the masts of both the Shenandoah and the schooner Alabama, acquired in 1967. 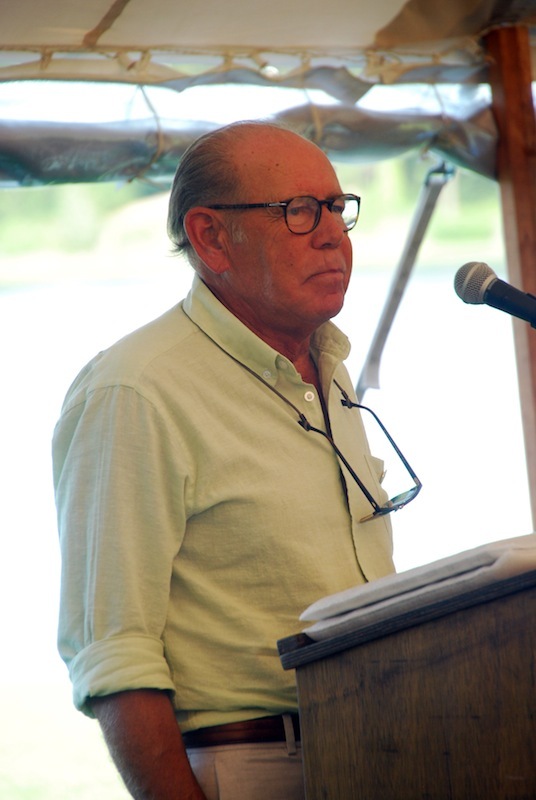 Longtime friend Denys Wortman bestowed the honor in the absence of boatbuilder Nat Benjamin, who was unable to attend. “Kids who live on this wonderful Island, so many of them have had that great, great opportunity to experience being on the water and learning how to sail,” Mr. Wortman said. A member of the audience pointed over Mr. Wortman’s shoulder at the Shenandoah sailing by in the Lagoon. Martha’s Vineyard Museum curator Anna Carringer recognized Mrs. Mayhew for her nearly 30 years of service as genealogist for the museum, formerly the Dukes County Historical Society. Mrs. Mayhew also served as secretary of the board of directors for many years. 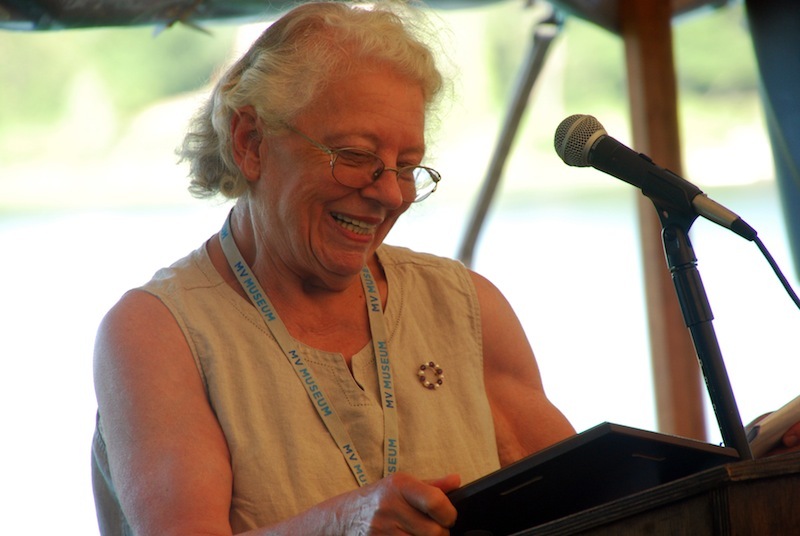 Ms. Carringer recalled her first encounter with Mrs. Mayhew, who was engaged in a spirited discussion among binders and folders in the library several years ago. Mrs. Mayhew shared stories of encounters and assignments over the years, including the challenges of tracking down Islanders who served in the World Wars (the Army could only say who survived) and being asked to identify 110 daguerrotypes of whaling captains. Over the years, Mrs. Mayhew has volunteered more than 17,000 hours to the museum. Museum director Phil Wallis thanked the three recipients for their commitment to the life of the Island. “We carry that forward as a beacon as we move forward to the next chapter,” he said. Just so lovely to hear of Island history and three people who've lived on and loved the Island so much. Did Mr. Butler's light guide any of the sea captains in my family home? A great day it would be to hear some stories from Mr. Douglas. Mrs. Mayhew, I know your name and I love my geneology. Walker,Coffin,Riggs and, well, you know the rest from there and back. If I'm blessed to be able to visit the Island, I have some new ideas of how to spend some treasured time (after a long rest at the Bend in the Road).